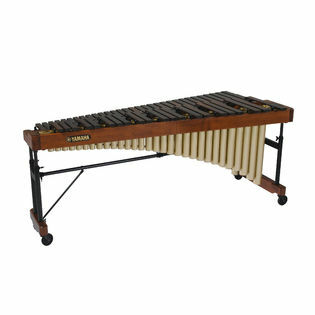 The Yamaha 4.3 Octave Professional Rosewood Marimba featues graudated rosewood bars and gas-shock height adjustment. Includes cover. Yamaha's exclusive tuning method ensures true pitch and full sound. Rosewood bars produce a high quality, traditional sound. The graduated tone bars are a professional feature that promotes full tone quality and projection. The cut-away designed resonators featuring 3-position tracking system allows resonator height adjustment for pitch and tone control and provides additional strength while reducing overall weight of instrument. The height adjustable frame feature pneumatic struts to allow height adjustments to be made easily by one person. The hinged resonators and rails and a two-piece crossbar make tear down a simple task. Oversized, 4" casters allow for easy transport over rough surfaces. Height adjustable: Height adjustable from 33 7/8" to 39 3/4"
Dimensions: 86 3/4" x 35 7/8"
This is the most portable, easiest to adjust, most durable concert 4.3 I'm aware of. It's a breeze to set up by yourself and has a very consistent, bright sound. If you're not in need of a 5.0, and want to go beyond Padouk/Plastic bars for your concert sound, then this is the best value.